We are pleased to announce the recipients of the 2018 scholarships: Sophie Malcomson, Bronte Hanson and Alyssa Rive. 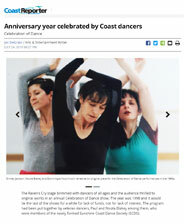 Jan DeGrass shares the history of the dance society in a recent article in the Coast Reporter. The Sunshine Coast Dance Society brings you dance that will entertain, inspire and, at times, challenge you. From renowned professional dance artists to local, grass roots performances, we strive to build a dance audience that loves dance as much as we do! Every year our Dance Residency brings emerging contemporary dance artists to the Sunshine Coast to explore and push the boundaries of contemporary dance. Residency artists create new works, offer workshops, master classes, and live performances for the community that are fresh, relevant and dynamic. Through our scholarships program, workshops, and master classes, the Sunshine Coast Dance Society supports our local, aspiring dancers in developing their craft. “Dance is the universal language.